Leading family short break provider, Center Parcs, has worked with one of their professional photographers to create a workshop for staff to help guests get the most from their holiday snaps. With the variety of photo-taking technology on the increase and staff across the Villages already keen to help families take photos whilst on a short break, the company has taken it a step further and provided additional photography training. 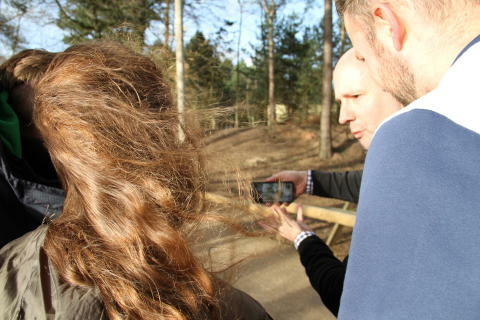 Already part of the Flourish in the Forest Center Parcs staff development scheme by Center Parcs, staff across the whole business offer to take photos of guests with their own devices when they see a photo moment is taking place. The photography workshops provide them with the confidence to use a variety of mobile devices as well as traditional cameras to ensure that when they take photos that really capture that special moment. The workshop teaches the theory behind taking a good photo, the best way to use cameras and mobile devices, tips, tricks, lighting and composition. The workshop finishes with a practical element with assessment at the end. “We’re delighted to have been able to add this workshop to our portfolio. We pride ourselves on a first class recruitment, induction and training programme and have helped thousands of people to learn and grow over the years. It’s not just about giving staff what they need but going above and beyond (like we would with guests), to make them feel empowered and enthused to do an excellent job. We look forward to offering this new course to many more colleagues in the coming weeks”.